This is the whiskey that turns a non-whiskey drinker into a friendly, sloppy, whiskey-filled birthday girl mess. You’ll think it’s good enough to drink by the half glass. Don’t bother with what your mother taught you…that whole “Stick with one kind of liquor” nonsense. What does she know? You are twenty-eight now. Total grown-up. You can make decisions. When your girlfriend asks you to have a Skinny Girl Margarita with her, you do it. It’s your freaking’ birthday, right? So what if you switch from tequila to vodka? That should be fine. You are twenty-eight. You know what you are doing. Not your first rodeo. So what if you’re not a big drinker? You just want to play Dance Central and show off some moves. How do I know all this? I might have been this birthday girl (yup). Headache. The rays of bright late-morning light beaming into your twenty-eight year old eyeballs, scorching them open. Nope, close your lids. That hurts. Do you have a massive head injury? You check for bleeding. Nope, all clear. That is ALL headache. You think to yourself that your mom has some wise advice. She knows what she’s talking about. You will not tell her this. You manage to guzzle down a bottle of water and a couple of Advil. It helps. The whole rest of the day you feel like you got hit by a party bus. You ate too much cake. You drank everything. You danced like it was a disco. You hugged most of your friends for a suspicious amount of time and told them all just how TOPS you think they all are. You made some inside jokes that you no longer remember. This is the year that it becomes glaringly clear that you cannot “party” like it’s 1999. Why did you think you could? Your hobbies are baking scones, and crocheting hats and maybe some light canning. You go to bed at 9:30 pm pretty much daily. You play eight Words With Friends games at a time with your Grandmother. You are about five years away from shaking your fist at hooligans when they try to walk on your lawn. This is what twenty-eight looks like. Real. Now, I don’t think twenty eight is old. I really don’t. But, this is the first birthday in a long string of birthdays that has hit me like a stampede of polar bear paws. Time is passing quickly. How did I get to be two years shy of thirty? Time. Is. Flying. I am thinking about creating a “things to do by the time I am thirty” bucket list. Wring the most out of my twenties. Maybe I will even add a “Don’t mix whiskey and tequila” note at the bottom of it. It is a good note. I assure you that when consumed properly and not like a hollow-legged sailor, this whiskey beverage is fantastic. Respect it, and it will treat you like a lady (or gentleman) right on back. It is smooth and sweet and needs no fancy mixers. It is a cocktail all by itself. Do not drink with vodka, tequila or rum. I don’t care how “skinny” those margaritas claim to be. It will be a bad choice tomorrow.You will get a headache. Listen to your mother, no matter how old you are. She knows things. This entire bottle went very quickly and was a huge hit among my friends. I think it would make a really great Christmas gift! I’ve been asked how I performed this magical whiskey makeover, so, let me tell you! Wash your apples well. Cut them up and put them into your clean airtight container. Allow it to sit for two weeks in a cool, dark place. Once it’s done, strain it. Although you are tempted, I would recommend not eating the apples. It looks like they’re going to be tasty. They are not. 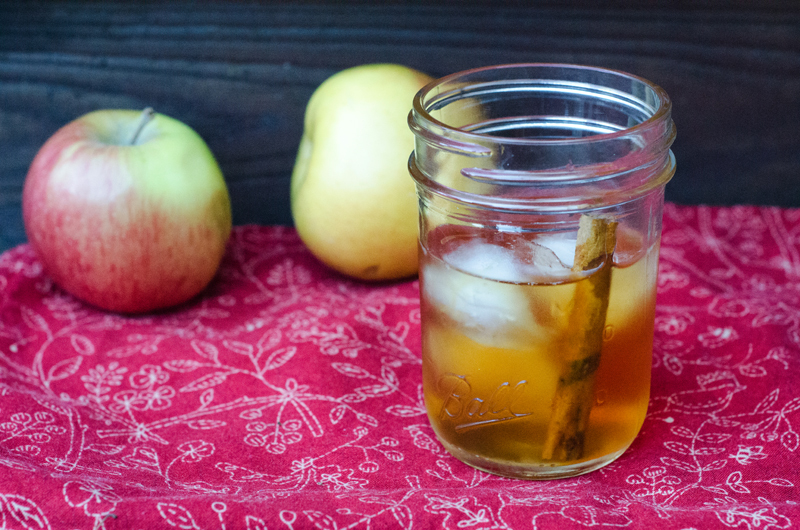 The sweet apple flavor now lives in the whiskey, leaving the apples tasting of rubbing alcohol (we tried them to take the guess work out of it for you). Now you can bottle it up! Funnel it into a bottle of your choosing. I found this appropriately festive, apple-covered bottle at my local Ross. Bottle it up and share it with some great friends! WARNING: might induce hugging, dancing, and general need to celebrate. I have dreaming of this concoction ever since I had it. ….I also might have been responsible for the Skinny Girl debacle. It’s a celebration of friendship, all rationale goes out the door. It was an epic 28th birthday, and YOU.ARE.TOPS. Oh, friend. A celebration INDEED. We got real skinny that night. It’s like you read my min. creepy. I was just telling my husband that I need to change my drink of choice from vodka to whisky… something preferably with apples and cinnamon. Looks like I just might have found my new drink. Giving this a try. OH, and HAPPY birthday! 28 isn’t all bad. Thanks, Michelle! I am sure 28 will be just dandy. ooooh my god i legit moaned when i read this. it sounds SO good. 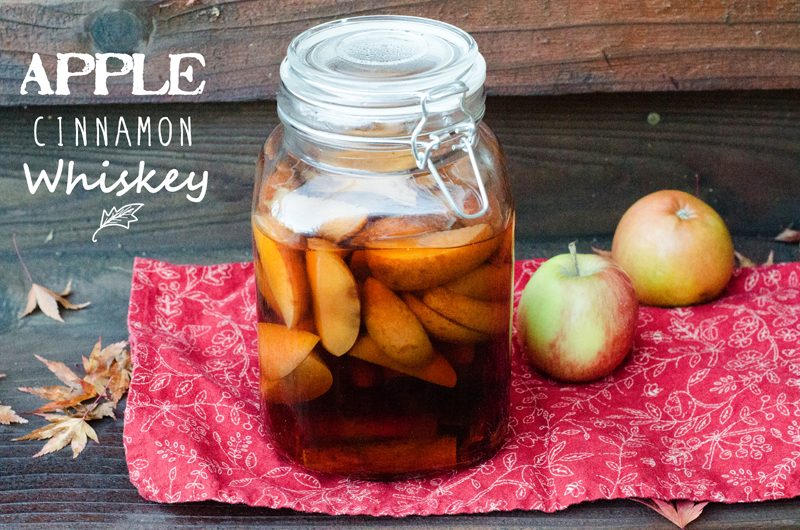 i love whiskey and i love apples, so clearly you’ve just given me a little slice of heaven with this here recipe. amazeballs. If you love those flavors, this is sooo for you. Let me know if you try it! Happy belated birthday and damn that stampede of polar bear claws! To be completely honest, my 28th birthday was very similar. Minus the really yummy apple whiskey, but with the tequila swapped up to vodka, then swapped to, dare I say, cheap beer! Oh yeah, I was one CLASSY lady. That being said, I was terrified of 30 and how the heck did I get to 28… all of those same questions for the universe. I just want you to know that my 28th year was one of the BEST years of my life and my anxiety about being 30 disappeared. Turning 30 was actually a cake walk, not sure what I was so freaked about. 😉 I swear those polar bear paws smacking me around helped me put a few things in perspective! 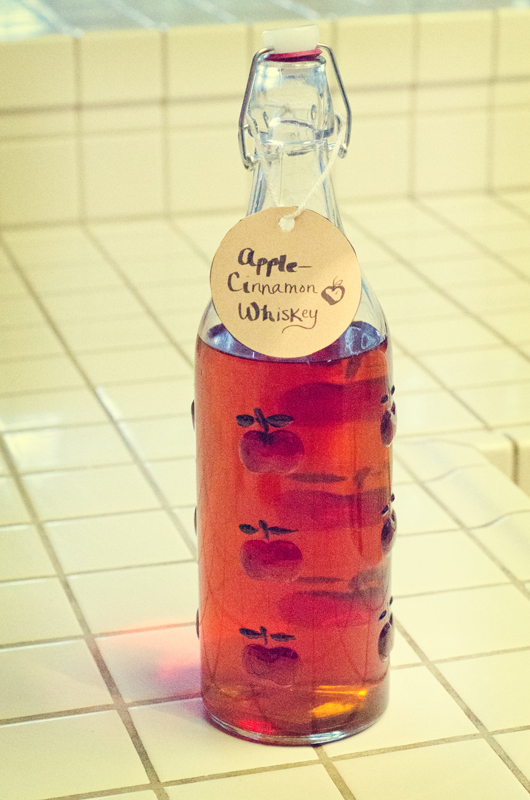 Thanks for sharing, I think I will make this apple whiskey yumminess for my awesome hubs. He will love it! Oh, Meg! You crack me up. I honestly cannot imagine what cheap beer would contribute to that frightening hangover. My goodness. Worst. Thanks for the “28 is going to be awesome!” pep-talk. I am sure it will be. It just floors me how fast time passes these days. Literally lightening WARP speed! I will be sure to thank the polar bears for their wake up call and just live a little more gloriously. Dance a little harder through the aisles at the grocery store! Be a little more present. Hello, this sounds like a great recipe…..i have a couple questions though, and I hope they don’t sound dumb. Do you have any whiskey brand recommendations, and what size bottle to recommene for the 6 apple ratio? I appreciate your help……….happy belated birthday…. Hi Nicki! Thanks for stopping by. I honestly used pretty cheap whiskey. I used a bottle of Trader Joe’s Blended Scotch Whiskey (It is 9.99 for a 1L bottle) I wasn’t sure how It was going to turn out, so i didn’t want to spend a fortune on a bottle of Makers Mark or something fancy. The great part is, it turned out really tasty. No need for the fancy stuff for this recipe. So, 1 liter of booze for every 6 apples. 🙂 Have fun infusing!! Always love a booze recipe! 🙂 If I may, I’d like to invite you to submit your photos to the new YumGoggle, a photo sharing site with the philosophy that if you worked hard to cook it and photograph it, we should show it off! Hope to see you there soon! Gorgeous opening shot girl! I love all the festive colors. I’m not a big drinker and unfortunately hard alcohol is not my thing. I had too much rum one night in college and that pretty much ended my hard liquor days. Ahhhh, 28, you still have many more amazing years to go. I loved my 30’s as they were my years of exploring and gaining insight into myself and now that I’m 40, I feel like I can do anything. This looks awesome and what a wonderful gift idea. Just pinned! So a question from someone not in the ‘know’ and who hasn’t drank whiskey for years. Hey Neva! You could use any type of whiskey. I am making it again this year and using Jack Daniels. The flavor from the apples and cinnamon really transform it. Hey! I love this idea! Quick question: does it have to sit for 2 weeks? I’m going to a Thanksgiving party on TUESDAY (aka 6 days away) and I’m wondering if this would work? Thanks! That is the way I did it. 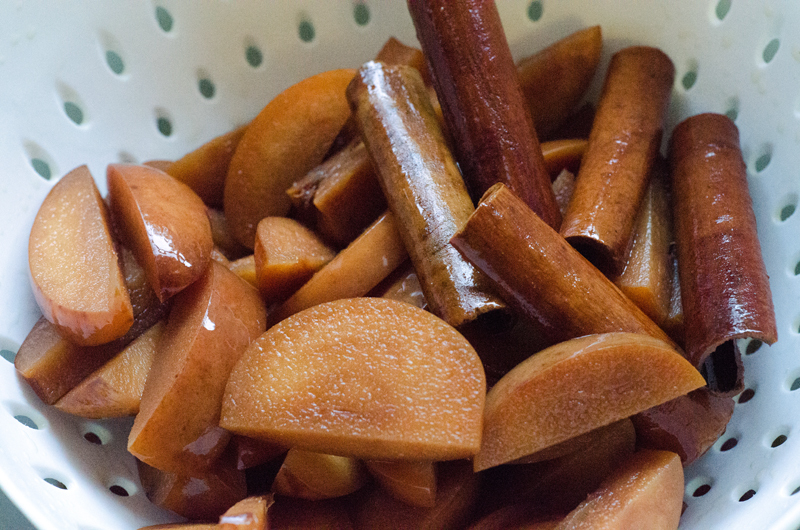 It allows the whiskey to leach all the sugar from the apples, get sweet and absorb the cinnamon flavor. I’m sure that it will impart some flavor in six days, but it might not be the full effect. I bet you it would still taste good.